* Note – Some jurisdictions require a certified food protection manager MN to be present at all times the business is open and operating. 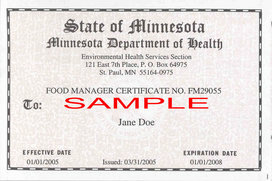 Safe Food Training is one of the private training companies approved by MN Department of Health to conduct food manager certification classes and proctor the examinations. We can also customize a class to meet your organizations specific needs. All in-person classes are taught in English, however, we provide the tests in several different languages: English, Spanish, Chinese, and Korean. We also provide on-line CFPM training that can be taken at you leisure in English and Spanish. We are proud that over 90% of our students pass the food safety certification MN exam on their first try!